Adaptive Operator Selection (AOS) is a method used to dynamically determine which operator should be applied in an optimization algorithm based on its performance history. Recently, Upper Confidence Bound (UCB) algorithms have been successfully applied for this task. UCB algorithms have special features to tackle the Exploration versus Exploitation (EvE) dilemma presented on the AOS problem. 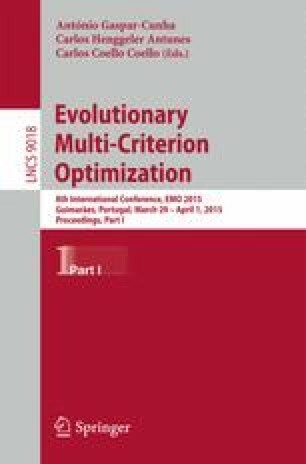 However, it is important to note that the use of UCB algorithms for AOS is still incipient on Multiobjective Evolutionary Algorithms (MOEAs) and many contributions can be made. The aim of this paper is to extend the study of UCB based AOS methods. Two methods are proposed: MOEA/D-UCB-Tuned and MOEA/D-UCB-V, both use the variance of the operators’ rewards in order to obtain a better EvE tradeoff. In these proposals the UCB-Tuned and UCB-V algorithms from the multiarmed bandit (MAB) literature are combined with MOEA/D (MOEA based on decomposition), one of the most successful MOEAs. Experimental results demonstrate that MOEA/D-UCB-Tuned can be favorably compared with state-of-the-art adaptive operator selection MOEA/D variants based on probability (ENS-MOEA/D and ADEMO/D) and multi-armed bandits (MOEA/D-FRRMAB) methods.